You are not limited to the personal stories of yourself and others in corporate storytelling. Why not call upon the power contained in a few centuries worth of stories? When you speak in public, you want your audience to be immersed in your subject and able to hold on to your message well after you finish speaking. This desire and need actually applies to storytelling in nearly any situation, from classroom to boardroom to sanctuary to platform. Mixing in some good myths, legends, fables or fairytales into your public speaking can enhance the character of your presentation. In addition, with this business storytelling technique, you will connect at a much deeper level with your audience than you can when you use personal stories alone. I call these types of stories “world tales.” However, it is hard to just pick one up from any source and use it. It takes some adjusting, rewriting and customizing. Let me give you an example. I recently had the chance to coach a client who wanted to add more storytelling to her presentation. She knew that she already had enough personal stories, but wanted “something more” to round out her presentation. She was looking for a story that demonstrated the dangers of staying in the same old place, staying in the same old rut. She had a very specific audience in mind and was finding it hard to get just the right story. TWO FROGS were neighbors. One inhabited a deep pond, far removed from public view; the other lived in a gully containing little water, and traversed by a country road. The Frog that lived in the pond warned his friend to change his residence and entreated him to come and live with him, saying that he would enjoy greater safety from danger and food that is more abundant. The other refused, saying that he felt it so very hard to leave a place to which he had become accustomed. A few days afterwards, a heavy wagon passed through the gully and crushed him to death under its wheels. 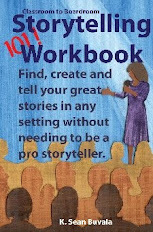 I suggested to her that one of the keys to using world tales is the ability to adapt a story to fit your presentation. I told my client that I would adapt this story for her as part of our coaching time. She agreed. Once, there were two frogs. One lived out in the country in a clear, clean pond and had everything that she wanted. She was so happy to be in the outdoors. Her sister, however, lived in the big city in a little canal by the side of the road- where it was busy and dangerous. One day the country frog visited her sister in the city. The city frog complained about how noisy it was in the city and how hard it was to see the moon at night because of all the tall buildings. The country frog then told her, "It sure is dangerous here. Why don’t you come out to the country with me and live free and happy? I can see the moon anytime I want." "No," said the frog that lived in the city, "I heard there are many snakes out there, and there’s all that mud, and besides, it takes so much energy to move out from my home. I’ll just stay here; at least the canal always has water in it." The country frog returned to her home, where she was always happy and free. The next day, the city frog was caught up in a net by a small child, who took her home and put her in a big jar where she was kept with water and fed every day. There the frog remained for the rest of her life, never seeing the moon again, but she did have a never-ending supply of dead flies. You will notice that I took the essential “core” of the story and adapted it to fit the needs of my client and her audience. I kept the essential concept of taking the safe path vs. risk taking, keeping the idea of staying in a canal/rut/gully to fit well into her need to talk about “getting out of your rut” in her upcoming presentation. I also had to address her concern about her perception of the violence in the story while still keeping the idea that the frog’s failure to break free of the “rut” would result in frustration and death. I substituted the finality and violent image of a squished frog to that of a captured frog. Who knows, perhaps some day the captured frog could be freed? I have not shared with you the final version of the story as my client further adapted my first draft to fit her audience. Once she saw that she was not limited to the version she did not like, she quickly used my draft to develop a story that she loved and would be unique to her individual presentation. When a person objects to a “world tale” in their work, it is most likely because they object to the single version of the story they have discovered. Although it may take some time to develop a new version of a story from the base idea of the tale, it is well worth it. “World tales” allow you, as the speaker and presenter, to tap into the deeper meanings that have made such stories a staple for many different cultures for many centuries. Take a chance with stories! In the end, do you want your audience to feel connected to you, to have the “aha!” moment that such stories create? Mix in and explore the power of the “world tale” to magnetically attract your audience to your message. To learn more about creating stories such as the world tales, attend our “Ancient Secret of Public Speaking” workshop. For information, visit http://www.executivespeakingtraining.com. C.2008 The official blog for K. Sean Buvala, storyteller and storytelling coach. Photo used under CC license from this site. I am in part a "business storytelling coach" and I support your concept of adapting world tales (Love that term!) to help make a business point. It's your story, you can use it in any way that helps people get a gut-level, emotional understanding of your point. It does take courage for business people to tell stories, but those that do, develop an ability to influence. They establish a leadership presence that compels attention. Great blog post! Great article Sean! When I started as a storyteller I also had a holier-than-thou attitude to folktales and would only tell them as I found them. With help from fellow drama students, I learned how to adapt them and now it is one of my greatest pleasures. I find, as you may also Sean, that once I have rewritten there is another honing process which happens organically as I tell it. The story transforms itself a little more each time I tell it slowly becoming more closely aligned with who I am and what my audiences seem to resonate with.